The Highland Council has thanked the public for their consultation at community drop-in events with the completion date for work being carried out on the Stromeferry bypass set for Friday November 23. Information events have been held in Lochcarron and Achmore over the past two weeks to address the concerns of those either side of the bypass who face disruption to travel as work is carried out. Councillor Allan Henderson, chairman of the Highland Council’s Environment, Development and Infrastructure Committee, said: “We would like to thank everyone who came along to the two sessions held in Achmore and Lochcarron for their feedback and suggestions. “I hope the published questions and answers provide a lot of the information people are looking for but our staff are available to answer any queries so I encourage people to get in touch if they feel they have anything to raise or need any clarification. Work is currently been undertaken on the rock face with engineers removing loose rocks, vegetation and soil as part of their scaling work. The removal of these hazards is to allow for anchors to be secured in position on the rock face to allow for the installation of a new mesh netting system, due to begin this week, aimed at curbing the impact of falling rocks. 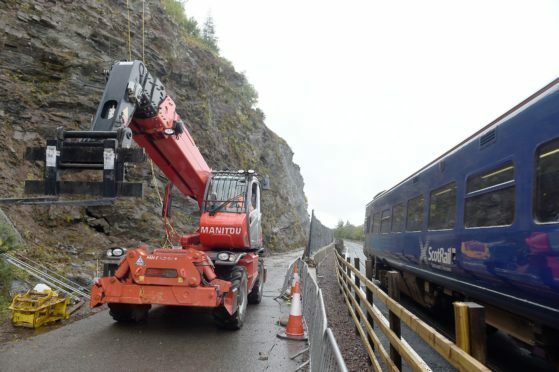 Calls have been made by local leaders in previous weeks to suspend rail services at Strathcarron with passengers disembarking and continuing their onward journey via a replacement bus service to allow for the road to rail diversion to remain open to motorists more frequently.